Every once in a while a game you've never played before will instantly become one of your all-time favourites! This run and gun game started off in the arcades in 1988 before being ported to the PC Engine / Turbografx-16 with an exclusive level and enhanced music. You start the game by choosing one of two characters and your job is to rescue the President who has been kidnapped. Initially it's a really good Ikari Warriors / Commando clone where you're shooting everything in sight and entering buildings to save hostages. You can even ride bikes and mow down enemies with complete abandon! There's a good selection of weapons available including flame throwers, shotguns, bazookas, grenades and knives. You'll need the latter for some boss fights when your other weapons are stripped from you and you have no choice but to engage in close quarters combat. At the end of Stage 4, Bloody Wolf pulls off a truly awesome plot twist. Once you've rescued the President you head back to your chopper and assume that that's the end of the game. However, it's only just getting started! Only one person can fit in the helicopter so you're left stranded and end up getting kidnapped yourself! The game then kicks you back out to the character select screen where you have to use the other player for another rescue mission! At this point, the gameplay branches out slightly instead of just sticking to the usual run and gun action. 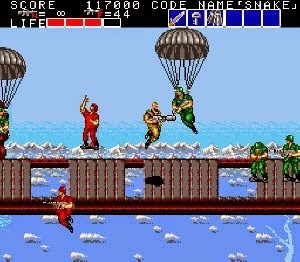 Stage 5 reminds me a lot of Zombies Ate My Neighbors (1993, Mega Drive, SNES) where you have to search across a huge level to find a certain number of hostages. Later on you'll have to fight on a moving raft as well as in marshland before eventually reaching enemy headquarters. What I like about this game is that it has a sense of humour (especially in the cut-scenes) and doesn't take itself too seriously. Even the enemy deaths are hilarious and overly dramatic! It's a tough game at times as bullets and grenades usually swarm you and some of the bosses are tricky without having a mid-range weapon to rely on. Luckily there's unlimited continues to keep you progressing. There is a bit of slowdown later in the game but you can actually use this to your advantage! Bloody Wolf is the best run and gun game I've ever played and it's interesting that I found it on a console that's primarily known for shoot-em-ups. Give it a go if you're looking for something different on the T-16 - it's a real hidden gem.